The Jewish community in Rome is known to be the oldest Jewish community in Europe and also one the oldest continuous Jewish settlements in the world, dating back to the first century BCE. The Jewish community in Rome is known to be the oldest Jewish community in Europe and also one the oldest continuous Jewish settlements in the world, dating back to 161 B.C.E. when Jason ben Eleazar and Eupolemus ben Johanan came as envoys of Judah Maccabee. Other delegations were sent by the Hasmonean rulers in 150 and 139 B.C.E. After the Romans invaded Judea in 63 B.C.E., Jewish prisoners of war were brought to Rome as slaves, Jewish delegates came to Rome on diplomatic missions and Jewish merchants traveled to Rome seeking business opportunities. Many of those who visited Rome stayed and the Jewish population began to grow. parade with the Temple vessels carried aloft. While the treatment of Jews by the Romans in Palestine was often harsh, relations with the rulers in Rome were generally much better. Julius Caesar, for example, was known to be a friend of the Jews; he allowed them to settle anywhere in the Roman Empire. According to historians, when Caesar was assassinated by Brutus in 44 B.C.E., Roman Jews spent day and night at Caesar’s tomb, weeping over his death. His successor, Augustus, also acted favorably toward the Jews and even scheduled his grain distribution so that it would not interfere with the Jewish Sabbath. Two synagogues were founded by slaves who had been freed by Augustus (14 C.E.) and by Agrippa (12 B.C.E.). 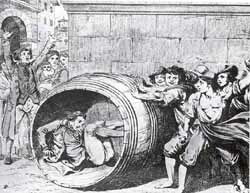 Twice in the Classic period, Jews were exiled from Rome, in 19 C.E. and in 49-50 C.E. The first exile took place due to the defrauding of an aristocratic Roman woman Fulvia, who had been attracted to Judaism. The second exile occurred because of disturbances caused by the rise of Christianity. It is not certain, though, that these measures were fully carried out or that the period of exile lasted a long time. During the Roman-Jewish wars in Palestine in 66-73 and 132-135, Jewish prisoners of war were brought to Rome as slaves. A number of the oldest Jewish Roman families trace their ancestry in the city to this period. Jewish scholars from Israel came to Rome in 95-96. In 212, Caracella granted the Jews the privilege of becoming Roman citizens. From the second half of the first century C.E., the Roman Jewish community became firmly established. A majority of the community were shopkeepers, craftsman and peddlers, but other Jews became poets, physicians and actors. Satiric poets of the time, such as Juvenal and Martial, depicted the raucous activities of the Jewish peddlers and beggars in their poetry. Evidence has been found that twelve synagogues were functioning during this period (although not at the same time). Unfortunately, none of those synagogues have been preserved. The Jewish position in Rome began to deteriorate during the reign of Constantine the Great (306-336), who enacted laws limiting the rights of Jews as citizens. Jewish synagogues were destroyed by Christian mobs in 387-388 and in 493-526 (during the reign of Theodoric). When Rome was captured by Vandals in 455, spoils of the Jerusalem Temple were taken to Africa. Once Christianity became the official religion of the Roman Empire, emperors further limited the civil and political rights of the Jews. Most of the imperial laws dealing with the Jews since the days of Constantine are found in the Latin Codex Theodosianius (438) and in the Latin and Greek code of Justinian (534). Some of the relevant decrees in these codes include prohibitions against making proselytes, intermarriage, owning slaves (slave labor was very common and this prohibition severely restricted the economic life of the Jews), holding any esteemed position in the Roman state, building new synagogues and testifying against Orthodox Christians in court. During this period there was a revival of Hebrew studies in Rome, centered around the local yeshiva, Metivta de Mata Romi. A number of well-known scholars, Rabbi Kalonymus b. Moses and Rabbi Jacob "Gaon" and Rabbi Nathan b. Jehil (who wrote a great talmudic dictionary, the Arukh), contributed to Jewish learning and development. Roman Jewish traditions followed those practiced in the Land of Israel and the liturgical customs started in Rome spread throughout Italy and the rest of the world. From the 1200's to the mid 1400's, treatment of the Jews varied from pope to pope. For example, in 1295, Pope Bonifice VIII humiliated a visiting Jewish delegation that was sent to congratulate him on his ascendancy; whereas, Pope Boniface IX (1389-1404) treated the Jews benevolently. He favored a succession of Jewish physicians and recognized the rights of Jews as citizens. On the other hand, Eugenius IV (1431-47) passed anti-Jewish legislation in the Council of Constance. The Jews of Rome fully participated in the flourishing economic and intellectual climate of the Renaissance. They became merchants, traders and bankers, as well as artisans. During the reign of Pope Alexander VI (1492-1503), however, a special tax was imposed on the Jews of Rome to pay for his military operations against the Turks. Later popes during the first half of the 16th Century were more sympathetic to the Jewish community than Alexander VI. The Medici Popes, Leo X (1513-1521) and Clement VII (1523-1534), treated the Jews well. Leo X abolished certain discriminatory levies, did not enforce the wearing of the badges Jews had been forced to put on in the 12th century and also sanctioned the establishment of the Hebrew Printing Press. Leo X, as well as other popes from this period, such as Sixtus IV, retained Jewish physicians in Rome. During the Reformation, in 1555, Pope Paul IV decreed that all Jews must be segregated into their own quarters (ghettos), and they were forbidden to leave their home during the night, were banned from all but the most strenuous occupations and had to wear a distinctive badge — a yellow hat. More than 4,700 Jews lived in the seven-acre Roman Jewish ghetto that was built in the Travestere section of the city (which still remains a Jewish neighborhood to this day) If any Jews wanted to rent houses or businesses outside the ghetto boundaries, permission was needed from the Cardinal Vicar. Jews could not own any property outside the ghetto. They were not allowed to study in higher education institutions or become lawyers, pharmacists, painters, politicians, notaries or architects. Jewish doctors were only allowed to treat Jewish patients. Jews were forced to pay an annual stipend to pay the salaries of the Catholic officials who supervised the Ghetto Finance Administration and the Jewish Community Organization; a stipend to pay for Christian missionaries who proselytized to the Jews and a yearly sum to the Cloister of the Converted. In return, the state helped with welfare work, but gave no money toward education or caring for the sick. These anti-Jewish laws were similar to those imposed by Nazi Germany on the Jews during World War II. During the Reformation, talmudic literature as a whole was banned in Rome. On Rosh Hashana 1553, the Talmud and other Hebrew books were burned. Raids of the ghetto were common, and were conducted to insure that Jews did not own any "forbidden" books (any other literature besides the Bible and liturgy). It was forbidden to sing psalms or dirges when escorting the dead to their burial place. Every Saturday, a number of Jews were forced to leave the ghetto and listen to sermons delivered in local churches. Also, whenever a new Pope was ordained, the Jews presented him with a Torah scroll. Jews continued to live in the ghetto for almost 300 years. In 1870, Italy was united as a nation under King Victor Emanuel, who decreed that the ghettos be dismantled and gave the Jews full citizenship. Following the end of the papal states, Jews fully integrated into Italian society. They comprised a significant percentage of the university teachers, generals and admirals. A number of Jews were involved in government and were close advisors of Mussolini; they convinced Mussolini to intervene in the First World War. Five Jews were among the original founders of the fasci di combattimento in 1919 and were active in every branch of the Fascist movement. Both Mussolini’s biographers, Margharita Sarfatti, and his Minister of Finance, Guido Jung, were Jews. In 1931, approximately 48,000 Jews lived in Italy. By 1939, up to 4,000 had been baptized, and several thousand other Jews chose to emigrate, leaving 35,000 Jews in the country. During the war, the Nazi pressure to implement discriminatory measures against Jews was, for the most part, ignored or enacted half-heartedly. Most Jews did not obey orders to be transferred to internment camps and many of their non-Jewish neighbors and government officials shielded them from the Nazis. Some Jews were interned in labor camps in Italy. After the north was occupied by the Germans in 1943, the Nazis wanted to deport Italian Jewry to death camps, but resistance from the Italian public and officials stymied their efforts. A gold ransom was extorted to stop the S.S. commanding officer in Rome from killing 200 Jews. Still, nearly 8,000 Italian Jews perished in the Holocaust, but this number was significantly less than in most countries in Europe. Roughly 80 percent of the Italian Jews survived the war. In 2000, a stone plaque was unveiled at the Tiburtina train station, the site of the deportations, to honor the memory of Rome's Jews, whom the Nazis deported from the city on Oct. 16, 1943. Today, a diverse community of 15,000 Jews lives in Rome (communita Ebraica di Roma). The Jewish community’s organization, based in Rome, the Unione delle Comunita Ebraiche Italiane, is directly involved in providing religious, cultural, and educational services and also represents the community politically. The monthly publication Shalom is the Roman community's key publication, and Rome also has Jewish cultural clubs and several schools. In 1987, the Jewish community obtained special rights from the Italian state allowing them to abstain from work on the Sabbath and to observe Jewish holidays At least 13 synagogues can be found in Rome, including a special synagogue for the Libyan Jews who immigrated to Rome after the Six-Day War in 1967. Three of thirteen synagogues are located under the same roof at Via Balbo 33 (Itlaki, Sephardic and Ashkenazi). The Italian chief rabbi officiates at the Great Synagogue of Rome and heads the country's rabbinical council. The continual presence of a Jewish community in Rome for more than two millennia has produced a distinctive tradition of prayer — comparable to the Sephardic or Ashkenazi traditions — called the Nusach Italki (Italian rite). The nusach has its own order of prayer and tunes. A number of synagogues in Rome, including the Great Synagogue, follow this tradition. Most synagogues in Italy are Sephardic. In October 2013, Rome's Jewish community gathered in the city's main synagogue to commemorate the October 16, 1943, roundup of Jews from the Rome Ghetto. The Jews were bound for Auschwitz; only a dozen survived. The community also discussed the passing of Nazi criminal Erich Priebke who was convicted for crimes against humanity from the massacre at the Ardeatine Caves outside Rome in which 335 civilians, mostly Jews, were slaughtered in cold blood. Roman archaeologists announced that they had found remnants of a Jewish cemetery dating back to the 14th-17th century, in March 2017. Gold rings and a scale, as well as 38 well-preserved skeletons were recovered from the site following a 6-year excavation. The only recognizable marker found for the gravesite was a tombstone fragment etched with a few Hebrew letters, which convinced leaders of the expedition that they had found a Jewish burial site. Experts who examined the skeletons concluded that they all showed telltale signs of malnutrition and starvation. 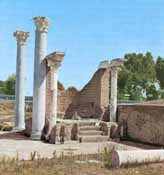 Among the places worth visiting is Ostia Antica, the ancient seaport near Rome. Jews in Ostia were middle class and participated in a variety of trades, such as blacksmiths, tailors, butchers and actors. They were better off than the Jews in Rome and permitted to build and maintain a fine synagogue. The synagogue of Ostia Antica is among the oldest in Europe and one of the oldest in the world. The remains of a 4th-century synagogue constructed on the site of a synagogue from the 1st century B.C.E. and the catacombs in Rome was discovered in 1961-62. Near the entrance courtyard of the synagogue is an area that contained a large oven, storage jars and a marble-topped table decorated with menorahs. It is believed this was a kitchen and/or dining room. Next to this room is one that includes benches that might have been used as beds by traveling merchants. 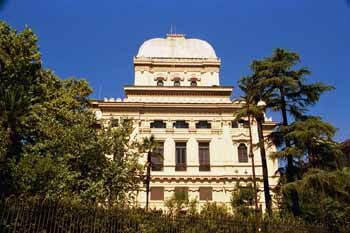 Another interesting synagogue to visit is the Synagogue of Rome, Longotevere Cenci, which was built from 1874-1904 after the emancipation of the Italian Jews following Italy’s unification. It has a unique Persian and Babylonian architectural design that contrasts with the rest of the city, which uses an ornamental baroque style. Inside the synagogue, a museum chronicles the history of Rome’s Jews. It is possible to visit the old ghetto in the Travestere section. The first stop in the ghetto should be the Museo del Folklore, which contains paintings depicting 19th Century Roman ghetto life. Also in the ghetto, on Via Della Regiella, there is a narrow street lined with seven-story buildings where the ghetto was so small Jews were forced to build upward. The place where Jews were sent for deportation during the German occupation is in the piazza (square) between Portico d’Ottavia and Tempo Maggiaore. A plaque on one of the buildings reads, "On October 16, 1943, here began the merciless rout of the Jews. The few who escaped murder and many others, in solidarity, pray for love and peace from mankind and pardon and hope from God." Many of the Christian churches offer magnificent artwork that contain biblical subjects and themes. Among Michelangelo’s many magnificent works in Rome is the statue of Moses in the Church of San Pietro in Vincoli. This is the sculpture with horns coming out of the head of Moses. The depiction was apparently based on a mistranslation of the Bible, which speaks of "rays" shining from Moses when he emerged from Sinai with the Ten Commandments. The Hebrew word for "rays" is similar to the word for "horns." 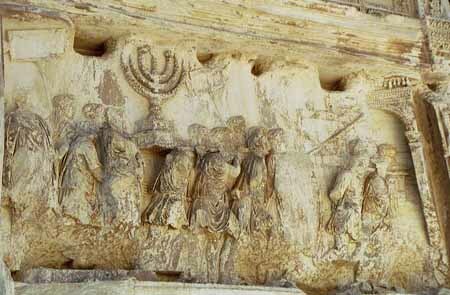 One important relic that ties Rome and Israel together is the Arch of Titus (opposite the Roman Forum). It was built by the Roman commander to commemorate his Judean victory in 70 C.E. It shows the triumphal parade with the Temple vessels carried aloft. A replica of the arch is in Beth Hatefutsoth, the Museum of the Diaspora in Tel Aviv. 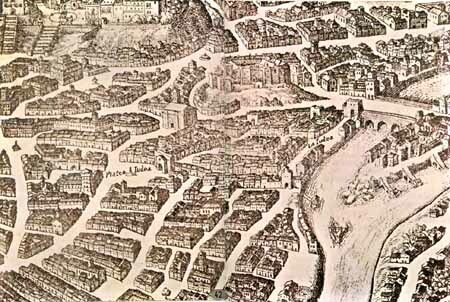 In 1645, Pope Urban VIII began construction on a defensive perimeter wall for Rome that was going to interfere with the city's main Jewish cemetery of Porta Portese. In April of that year, the new Pope Innocent X arranged for the Jewish Society of Charity and Dead to purchase an area of land in Cerchi and the cemetery was moved to this plot. As this area began to fill up, in 1728 Pope Benedict XIII gave the Jewish Society permission to buy neighboring land in order to expand, and once this plot was full as well, Pope Pius VI in 1775 pressured another landowner to sell a plot for the expansion of the cemetery. In 1934, more than a century and a half later, the government of Rome expropriated all land in the area of the 250 year old Jewish cemetery and began construction on a road that ran right through the heart of the burial ground. 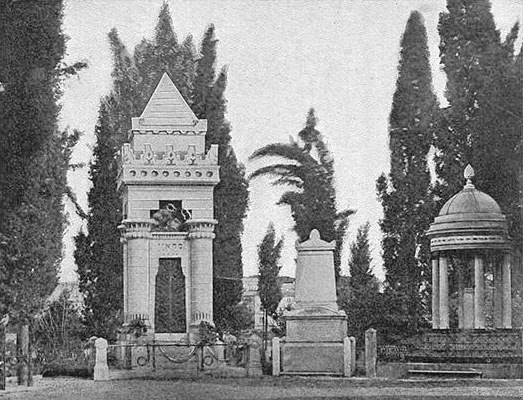 The cemetery was decided to be transferred to a part of the Campo Verano and working quickly to finish the road, the city exhumed and transferred bodies from the cemetery in a hurry, often times working on Jewish holidays and without religious Jewish supervision. A total of 7,800 corpses were recovered from the cemetery, but unfortunately not all of the bodies were properly identified. Additionally, in the rush to finish the project, many bodies were recovered as late as two days before the road was inaugurated while some areas were not searched and others were so haphazardly investigated that it is likely that thousands of corpses remain buried. In 1950, the city built a rose garden in the area, just a short distance from Circo Massimo and the Aventine hill. The president of the Jewish community at the time gave his consent for the construction of The Roseto Comunale of Rome with the condition that a single star be placed above the entrance to remind visitors of its sacred origin. This star is still present today. The other evidence of the Jewish connection to the site is the central staircase, which is in the shape of a menorah. Over two millenia, the Jewish community of Rome has left behind some of the most compelling records and artifacts ever found in Europe. Many of these archaeological finds are showcased in Rome's newly renovated Jewish museum, the Museo Ebraico di Roma. Although the museum has been open and functioning since 1959, a new European Union-funded $2 million renovation gave the museum a complete remodeling. Instead of merely exhibiting artifacts, the museum incorporates them with photographs and documents to narrate the history of Rome's Jewish community, the oldest community of its kind in Europe. Another permanent exhibit is the textile collection, which contains around 800 quality textiles from the 15th to the 19th centuries. The museum has planned to build a Textile Preservation Center, which will house some of the museum's most important finds. The fabrics will be placed in air-tight storage containers to prevent dust and sunlight that could be harmful to the antiques. Sources: Bridger, David (ed.). The New Jewish Encyclopedia. Behrman House, Inc. Publishers, New York. 1962. Eban, Abba. Heritage: Civilization and the Jews. Summit Books, New York.1984. Lachter, Lewis Eric. "When in Rome, feast on beauty and history," Washington Jewish Week, May 4, 2000. "Rome" Let’s Go Europe 1990, Harvard Student Agencies, Inc.
David, Ariel. Archaeologists in Rome uncover medieval Jewish cemetery, and its history of persecution, Haaretz (March 26, 2017). Photo Credits: Photos of medieval Jews, ghetto map, Ostia synagogue, Travestere copyright © Jews and Synagogues. EdizioniStorti Venezia. 1999, the remainder copyright © Mitchell Bard.